View the updated CDM program! Click the image below to view the scientific program. 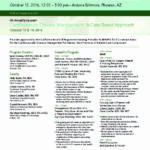 Register for the nursing symposium. 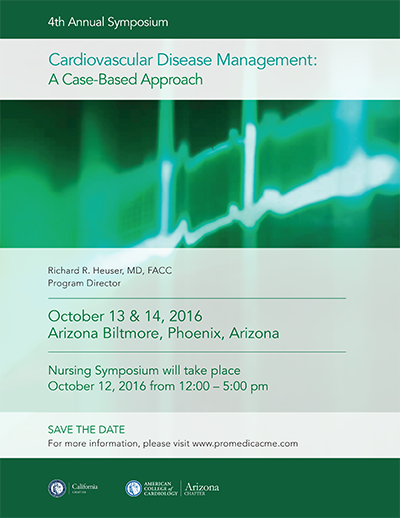 Registered attendees of the “CDM 2016” symposium are welcome to attend the satellite symposium on October 13, 2016 from 6:45 – 7:45 am as complimentary guests. When you register for the main scientific sessions, you will have the option to register for this additional course. This two-day continuing medical education symposium will center on the nuts and bolts of everyday care for patients with cardiovascular diseases, and present new ideas for tailoring the most appropriate treatment plan for each individual. Focus will be placed on gauging and monitoring therapy, including recognizing symptoms, evaluating risk factors, guiding treatment through imaging, general and functional testing, and appropriate therapy. Unlike most programs, this will be delivered as a case-based approach. In other words, how would I manage a diabetic patient with these lipid levels? Case examples make the lectures more relevant to everyday practitioners. IASIS Healthcare Employees Register Here! 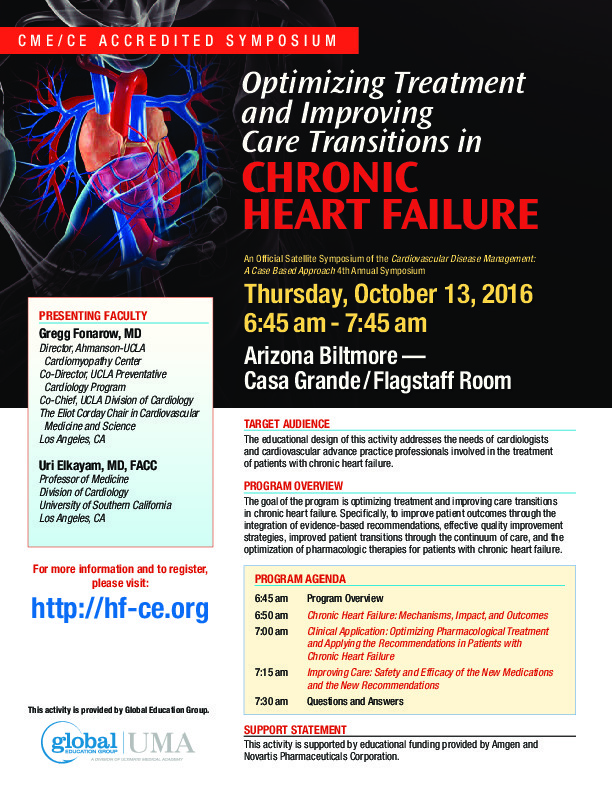 This symposium is designed for clinical cardiologists, primary care physicians, interventional cardiologists, cardiovascular surgeons, basic scientists, vascular medicine specialists, nurses, perfusionists, cath lab technicians, and other health care professionals with a special interest in the field of cardiovascular medicine. The presentations will also be relevant to pracitioners involved in foot care. Promedica International designates this live activity for a maximum of 12.5 AMA PRA Category 1 Credit(s)™. Physicians should claim only the credit commensurate with the extent of their participation in the activity. 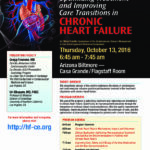 Provider approved by the California Board of Registered Nursing, Provider #8495 for 12.5 Contact Hours for the Cardiovascular Disease Management symposium. Thursday, October 13th (7.8) and Friday, October 14th (7.2). The group rate deadline for reservations at the Arizona Biltmore has passed, however if you need a room, please contact Rebecca Law with the dates of your travel to see if there is current availability. All cancellations must be submitted in writing and refunds will be subject to a $100 administration charge. Cancellations cannot be accepted over the telephone. Refunds will not be available after August 29, 2016. Promedica International CME © 2016 All rights reserved.